Fort Wayne Indiana Tow Truck Insurance – Low Rates Call Now! Need low rates on Fort Wayne Indiana Tow Truck Insurance? If so call Pathway Insurance by dialing 1-800-998-0662 Monday through Friday until 5 PM Central Standard Time to speak with one of our licensed agents. If you find our website after 5 o’clock use our online chat system up until 8 PM to speak with licensed agents Monday through Friday. If you find us on the weekend we are available up to 5 PM Saturday and Sunday when you need Indiana Tow Truck Insurance Quotes. While it’s true everyone wants to get the best price on the commercial truck insurance for their business you don’t want to take shortcuts to save money because it will only come back to haunt you later. Let’s continue our fictitious coverage scenario. Tow Truck Insurance Fort Wayne Indiana — Avoid Using Creative Ways to Buy Tow Truck Insurance Part 5. 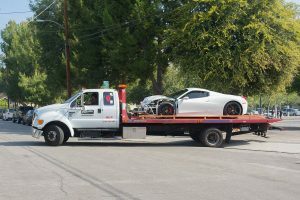 In our previous article we learned about “Tricky Ricky” he started a new tow truck company and he quickly found out he could not afford Commercial Tow Truck Insurance so he added his wrecker on his personal auto policy. Eventually Ricky’s stunt will backfire on him but we need to find out how it happens and learn a little bit about the underwriting process that occurs with insurance companies when any person or company buys a commercial insurance policy. To learn about the process we will revisit a conversation between Mr. Dudley Dew Right – the agent that Ricky got a quote from for Commercial Tow Truck Insurance and Stan Earnest sales manager of XYZ Auto Insurance Company, the company Ricky told Dudley that he bought a commercial policy from. Stan Earnest after hanging up with Dudley Dew Right is a bit bothered by the conversation, either Mr. Dudley Dew Right is a nut job or there is something to what he related. After about 15 minutes Stan decides to call Dudley back, he finds Dudley’s telephone number on his caller ID. “Sure Stan, what can I do you for?” Dudley replied. “As I recall it was an F150, why do you ask?” Dudley responded. underwriting so would you mind sharing that VIN number with me and the customer name?” Stan asked. “I can do that Dudley this is just between me and you as two professionals.” Stan declared. Dudley provided the customer name and VIN number to Stan and they both said goodbye. In our next article we will learn what happens next in the underwriting department. Fort Wayne Indiana Tow Truck Insurance — Super Low Rates for Tow Operators. You can count on Pathway Insurance to help you find great rates for Tow Truck Insurance in Fort Wayne Indiana and the surrounding areas.